Inspirational quotes are one of the best ways to boost your imagination and creativity in new levels. Inspirational quotes can help you reach new heights in brilliant ideas that come out of years and years of exploring human behavior and nature. Being creative is never easy, it takes a lot of effort. But now you can cheat nature and get original ideas by browsing these amazing inspirational quotes! Inspirational quotes help us to see things from different angles. By looking at things in another way, it can help us to let go of negative emotions and develop positive ones. It will be great to share the encouragement you receive with your family and friends. You can make a positive influence in their lives. Yo achamma ko jindagi ko upahar ma sachchikai birsanu sajilo nai xa. Hamro jivan yo brahmand ko ek sano prakash ko ek xin ko jhilka matra ho. Tai pani yo chhoto kshyan ko lagi hami aapno astitwa ko chamatkar ko anubhav garxou. Jivan ma sakaratmak dristikon rakhda prerana khojna ko ek mahatwa purna bhag ho. Mathiko haraph ma ke tapai le prerana mahasush garnu bhayo hamro brahandako bishalata ra yesh bhitra ko hamro anoutho sthan ko barema, ke tapai achamma ra nirash mahasush garnu bhayo ? Jivan ma sakaratmak dristikon rakhda tapai lai aanand lyaunexa ra Jivan ma asha ko prerana die rahanexa. Timi Nirash Na hou, kamjor timro samay ho timi Hoina !! Aashabadi byakti ka lagi dristikon saphalata ko khudkila banna sakchha bhane nirasabadi byakti haruka lagi bato kokada !! usle saphalata sajilai hat parna sakxa. usko halat jiudo las jhai hunchha. !! People can also get inspired by more ordinary things found in everyday life, such as a flower that blossoms or a rainbow that shines after a thunderstorm. Inspirational baby names like Zen or Heaven have traditionally helped boys and girls to get introduced in philosophy as they bring into their mind the higher values that they represent. Tapai lai jindagi ma tyo milxa jun tapai lai chahiyo chahiyo. Manish hawama udna suru garchha ani nramro sang pachharinxa !! Upahar sano hos ya thulo… kasai bat sammanit bhyer paunu nai garv mahasus hunchha !! Bhagwan lai mandir ma bhanda badhi aspatalma yad garido rahechha !! Ajhai kati ber lagxa !! Paristhiti ne kuti kuti sikaune rahechh . Inspirational quotes on life enable individuals and give them a superior comprehension of life. 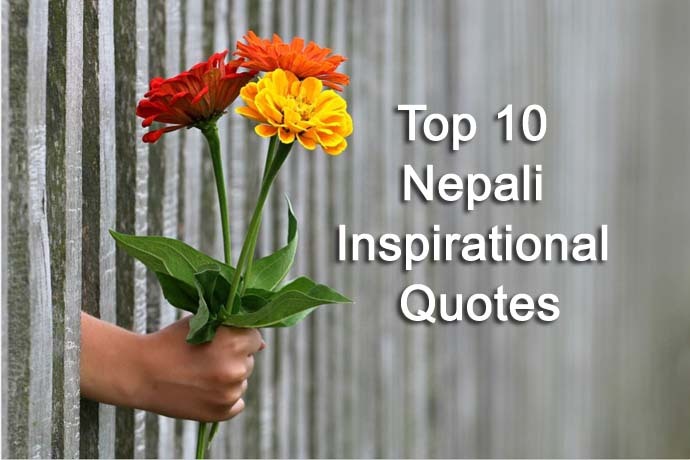 Discover dozens inspiring quotes that can motivate you to the fullest! Inspiration comes from all kinds of different sources. You can read a book, a poem or an article in the newspaper.